Free weights — dumbbells and barbells — are excellent strength training investments for a home gym: They’re simple, versatile, and relatively inexpensive. For a beginner, dumbbells (the short weights that you can lift with one hand) should be a higher priority than barbells (the long ones that require both hands). Dumbbells give you more exercise options, and they force each side of your body to pull its own weight. The best, most convenient option is to buy several pairs of dumbbells — 5-pound weights, 10-pounders, 12-pounders, 15-pounders, and so on. The cheap choice: Buy an adjustable dumbbell kit. A kit comes with two handles and several weight plates that you clamp onto each end of the handles with a clip or screw-type mechanism called a collar. These kits sell for $30 to $100, depending on the quality and the number of weight plates included. Owning a whole array of dumbbells saves you lots of time over an adjustable dumbbell kit that requires you to constantly have to remove the collar and add or subtract weight plates. Shop around and try out different brands of dumbbells. Some have contoured handles that may feel more comfortable than straight ones. Some dumbbells have foam grips; others are coated in rubber. Dumbbells with hexagonal ends are great because they won’t roll away. A dumbbell rack is also a good idea. A rack will keep your weights organized and your home gym looking tidy. Dumbbells give you a variety of exercise options. 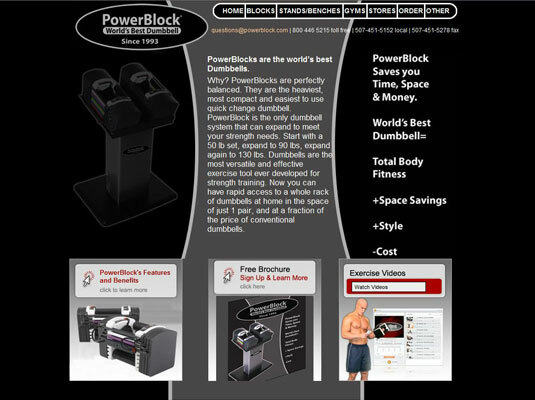 If you don’t have the space for a whole array of dumbbells but don’t want to fiddle with dumbbell kits, either, you may want to look into PowerBlocks. Each block consists of a series of rectangular, weighted, metal frames, each one nesting inside a slightly larger frame. A series of holes runs along the outside of the frames; you insert a pin inside a hole to select the number of frames you’d like to pick up. You can buy a set of blocks that go from 5 pounds to 90 pounds in 5-pound increments, and you can change the weight instantly.